PALO ALTO, Calif. — In a darkened garage here, Steve Perlman is giving digital actors a whole new face. A former Apple Computer engineer who previously co-founded WebTV Networks and the set-top box firm Moxi, Mr. Perlman is now putting the finishing touches on Contour, a futuristic camera system that will add photorealistic three-dimensional effects to digital entertainment. The new system will be introduced today at the Siggraph computer graphics conference in Boston, and effects created with it could start appearing as early as next year. The system could change the nature of cinematography in several ways, according to leading Hollywood producers and technologists who are planning to use the system. For example, it will make it possible to create compellingly realistic synthetic actors by capturing the facial movements of real actors in much greater detail than is currently possible. An actress goes from live performance, left, to phosphorescence, to a Contour-generated image, right. David Fincher, who directed the films “Fight Club” and “Panic Room,” is planning to use Contour next year when he begins filming “The Curious Case of Benjamin Button,” a movie based on a short story by F. Scott Fitzgerald in which Brad Pitt will play a character who ages in reverse. 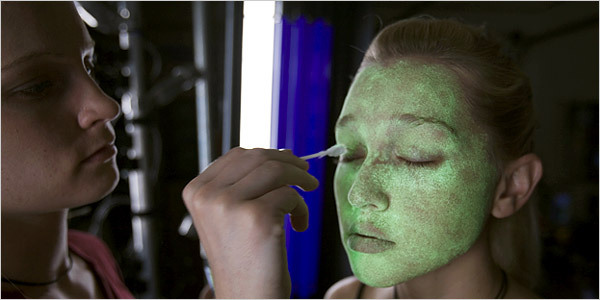 The Contour system requires actors to cover their faces and clothes with makeup containing phosphorescent powder that is not visible under normal lighting. In a light-sealed room, the actors face two arrays of inexpensive video cameras that are synchronized to simultaneously record their appearance and shape. Scenes are lit by rapidly flashing fluorescent lights, and the cameras capture light from the glowing powder during intervals of darkness that are too short for humans to perceive. The captured images are transmitted to an array of computers that reassemble the three-dimensional shapes of the glowing areas. These can then be manipulated and edited into larger digital scenes using sophisticated software tools like Autodesk’s Maya or Softimage’s Face Robot. Until now, realistic digital actors have required significant amounts of computing power, at great expense. Mr. Perlman’s system is a leap forward for a technology known as motion capture, now widely used in video games and in movies like “The Polar Express,” which starred Tom Hanks in various digital guises. Motion capture cuts the costs of computer animation while creating more natural movement. 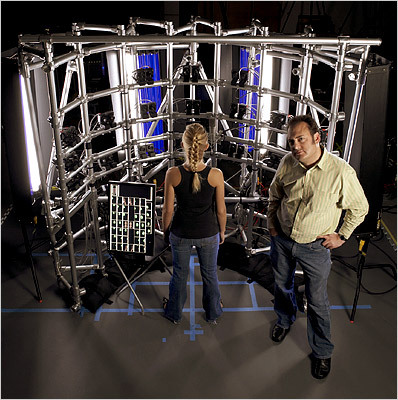 Today’s motion-capture systems work by tracking the locations of hundreds of reflective balls attached to a human actor. This permits the actor’s movements to be sampled by a camera many times per second. But the digital record is limited to movement, and does not include the actual appearance of the actor. The difference offered by Mr. Perlman’s technology is in the detail. Standard motion-capture systems are generally limited in resolution to several hundred points on a human face, while the Contour system can recreate facial images at a resolution of 200,000 pixels. The digital video images produced by the system are startlingly realistic. Mr. Perlman, who helped develop Apple’s QuickTime video technology, said the computer-generated animation techniques pioneered by Pixar Studios were reaching a visual plateau and, as a result, losing some of their audience appeal. “We are programmed from birth to recognize human faces,” Mr. Perlman said. There are some limits to the new technology. For example, the Contour system can capture eyebrows, mustaches and short beards, but it is not able to capture freely moving strands. It is also not able to capture areas where makeup cannot be applied, like the eyes or the inside of the mouth. The Contour developers are now experimenting with plastic teeth molds with embedded phosphor powder. If the Contour system can be commercialized, it will allow digital film directors to easily and inexpensively control camera angles and generate elaborate visual fly-throughs in movies. It will also lower the cost of creating fantasy characters like Gollum in the “Lord of the Rings” trilogy. In addition to films, the new system will be valuable in creating more realistic video games, Mr. Perlman said. A major video-game development company has committed to use the system in future games, he said, adding that he could not give its name at this time. The Contour system has been developed by a small team of software and hardware engineers that Mr. Perlman has assembled in the garage of his home in Palo Alto, Calif., over the last three years. He rewired the garage to handle the power requirements of the lighting system and a small graphics supercomputer that was built from scratch. Contour will be distributed by Mova, one of a group of start-up firms that Mr. Perlman has assembled since he left WebTV in 1999, after it was purchased by Microsoft. Contour is not the only attempt to develop more advanced digital cinematography techniques, said Richard Doherty, a digital media consultant who is president of Envisioneering Inc., in Seaford, N.Y.
Walmart clearing out RCA’s HD DVD for $350? That is if it is true. Has anyone else seen one of these players on the clearance rack? Microsoft hosted an important event in Redmont the other day where they demonstrated the upcoming Windows Vista in front of major press and analysts. The demonstration could have gone better, hehe. Here’s the video from yesterday’s buggy demonstration of the speech recognition of Windows Vista performed in front of major press and analytics in Redmont. I just got a Nokia E61 on T-Mobile. When I signed up, I knew that the signal was really weak in the back of our house – the building forms a large square, and my bedroom faces into the centre of the square. I could get a signal in the living room (just), but wouldn’t it be great, I thought, not to have to go through there every time the phone rings. Although outside my house full-strength UMTS signals are readily available, the building’s construction prevents them diffracting into the internal ‘courtyard’. All I needed was enough reception to receive and send SMS messages. I have home WiFi for data access, and I can potentially make calls over that too. I planned to aim for UMTS reception rather than GSM since: a) I didn’t know which GSM frequency to aim for and b) E series Nokia phones maintain their batteries better if they have UMTS signals (otherwise they constantly search for a UMTS signal). I tried two car-type external antennas that I got via eBay – but unfortunately the gain on both of these was just too low (barely even compensating for the losses in the cable running to the phone). Also, neither were sufficiently directional to catch enough of the reflected signal to give me anything to work with. The first step was the figure out what the extent of the problem was. I located my nearest T-Mobile base station using the government’s Sitefinder service. This also confirmed the frequency that the transmitter used – 2100Mhz. This is the standard frequency for UMTS (i.e. 3G) services in Europe. By drawing a line between the transmitter’s location and my building in Google Earth, I was able to confirm the approximate distance and angle of the signal I needed to catch. Buying a directional antenna wasn’t really an option – for a start, they are expensive – and anyway I couldn’t be sure that such an antenna would actually help. If it didn’t, I’d have wasted £60-£100. However, in an incredibly geeky flash of inspiration, I realised that there really isn’t much difference in operating frequency between WiFi (around 2.4Ghz) and UMTS (2.1Ghz). And there are loads of different clandestine WiFi antenna ideas floating around the Internet. If I could find an easy-to-build directional WiFi antenna, perhaps I could reverse-engineer its dimensions and adapt it for 2100Mhz use. So I set about the task. I decided on the biquad antenna type, as it’s fairly compact and easy to build, yet provides decent (10-14dB) gain and is quite directional. My primary sources of information were the many WiFi biquad and double bi-quad antenna tutorials and blog entries, such as: Engadget’s; Trevor Marshall’s tutorials. More can be found on my del.icio.us page for the tag ‘antenna’. Both WiFi and UMTS operate in microwave frequencies – however, there’s a substantial difference between the middle WiFi channel (around 2.4Ghz – what people usually tune their WiFi antennas to in order to give a good amplification factor across the channel range) and UMTS’ 2.1Ghz. To my knowledge no-one has built a homebrew biquad UMTS antenna before, so there wasn’t much to go on. What also didn’t help was that most WiFi biquad tutorials just give you the measurements verbatim – not the calculations of formulae. Having done no physics since school, my expertise in antenna building is poor to say the least. Still I did realise a few things about most of the designs floating around the Web: all of the dimensions were multiples of the wavelength at 2.44Ghz (122mm or 0.122m). So then, I just needed to figure out the multiplication factors in each case and I was sorted. I made the reflector out of galvanised steel mesh and mounted an N-type connector to the centre. I made an N-type coaxial to FME coaxial cable to hook up the phone to the antenna. The emitter itself is made from the copper centre conductor taken from a length of high-quality satellite TV coaxial cable that I had left over. I used some scrap wires to connect the ends of the biquad ‘bow-tie’ back to the reflector, and placed some of the original dielectric insulation from the satellite cable back on the ends of the bow-tie’ shape to prevent the antenna from ’shorting’ (in an RF sense). The emitter is then soldered into the N-type connector in a most slapdash style. I didn’t have enough mesh to make the ‘lips’ of the antenna’s reflector match the measurements I’d planned, but made them the longest equal lengths that I could. In other respects, I managed to get the dimensions down to within a couple of millimeters of my target measurements. High-quality cable is a must – I only used 50cm or so of RG-58 type cable to go between the phone and antenna, and unless you’re using something very high-grade (like LMR-400), I wouldn’t go too much further than that. Presently the antenna is fixed and aimed in a pretty shoddy way – it’s fixed onto a set of ‘3rd hands’ – and there’s a Post-It note there to provide (some) insulation between the stand and the reflector… I plan to investigate more permanent mounting options at some other date. The biggest problem with the antenna is aiming it – but having said that once it does catch a signal, the phone holds on to it very well. I’m aiming it over the rootfops of the building, hoping to catch some of the signal’s diffraction. I have no idea how much gain the antenna produces. When aimed correctly (which is very tricky), it gives me a consistent 1-bar UMTS connection, or a 2 bar GSM signal. It works better at night, holding on to a signal for many hours. Citing the decreasing likelihood of a nuclear strike against the United States, the Pentagon is largely abandoning its operations at a Cold War icon: the hulking iron-and-granite complex known as Cheyenne Mountain in Colorado Springs, Colo., the Washington Post reported. Since 1966, teams of U.S. and Canadian military personnel belonging to the North American Aerospace Defense Command, or NORAD, have provided round-the-clock staffing to the site’s high-tech “war room” and its 15 buildings, which are located about 2,000 feet underground at the eastern end of the Rocky Mountains. At any given time, about 200 NORAD personnel monitored equipment capable of tracking missiles, long-range bombers and objects in space, including an apparent test of a North Korean missile earlier this month. The facility will remain in “standby” mode, with a few people continuing to work there in case it needs to be reopened. No jobs will be lost in the process, the military said. Others will resume their duties at nearby Peterson Air Force Base, where the commander of NORAD already works. Windows Genuine Advantage (WGA) software is installed on computers running Windows XP via Microsoft’s online update services. For most XP users, that means Automatic Updates, which Microsoft has worked very hard since Windows XP SP2 to make us run in full-automatic mode. WGA has already appeared in several beta versions, with slightly different behaviors, and Microsoft appears to be still actively developing this tool. For many people, the fact that the software giant delivers WGA as a security update is another strong note of insincerity. Microsoft may kid itself into believing that WGA has some sort of security aspect, but many knowledgeable computer users aren’t buying that. When WGA detects a problem, it lets you keep running Windows, periodically popping up nag screens informing you that your Microsoft software may be counterfeit. If this happens to you, you should pursue the process that WGA presents; it may provide you with information that will help you rectify the problem. For example, in my tests I was able to make the WGA “counterfeit” warning appear by changing the date of the system clock one month later. The Web-based WGA program was able to determine that was the problem and it suggested I reset the system date. When I did that, the WGA warnings disappeared. While most WGA detections don’t resolve that easily, it can’t hurt you to learn as much as you can about why WGA believes your copy of Windows or Microsoft Office may be illegitimate. With nag screens the extent of the negative effect, WGA doesn’t have much of a bite — for now. But might that change in the future? Microsoft has said it won’t “turn off” illegitimate copies of Windows. But could the software giant be interpreting that literally? The more likely preventive measure probably isn’t turning off the computer. It’s not hard to imagine that WGA might direct its predecessor, Windows Product Activation (WPA), to lock you out of your computer. When WPA kicks in, the computer boots to a login screen that doesn’t let you use the computer until a valid activation code is entered. In Vista, this WPA screen links to an option that lets you buy a new copy of Windows, letting you use Internet Explorer for that purpose. Microsoft has more than once alluded to the fact that it is reserving the right to enforce the installation of WGA on all computers, possibly sometime early this fall. WGA is built into Windows Vista, without any user option to remove it. It’s simply not known how Vista’s version of WGA will behave. It is still possible to both remove WGA and to prevent it from attempting to reinstall after you have removed it. There are many sites online that purport to help you remove WGA from your system, but Microsoft recently changed WGA and many of those sites now offer outdated advice. I have yet to see a definitive work on removing WGA, and I don’t consider this writing to be either. Since WGA is still in beta, and still under development, I suspect that the best set of instructions is yet to come. Important: These instructions require editing the registry. You may want to start by creating a System Restore point so that you can revert to it in the event that something goes wrong. Also, I attempt to go beyond uninstalling WGA Notifications to uninstalling other aspects and leave-behinds of WGA. I can’t promise that you won’t run into trouble. The one thing I can tell you is that I’ve done all this on my own computers without incident. If you prefer not to mess around with the System Registry yourself, there’s a free utility called RemoveWGA 1.2 available for download on the Internet from Firewall Leak Tester. 1. In the Add or Remove Programs Control Panel, turn on the “Show Updates” check box at the top. 3. Start by searching your entire system boot drive for any file containing the letters “wga”. 4. If WGA is installed on your computer, the search should return the filenames WgaLogon.dll and WgaTray.exe in your \Windows\System32 folder. You’ll also find WGA’s LegitCheckControl.dll in the same folder (but it won’t be in your search results). You may well have several other search results, and we’ll come back to those later. 6. Open the Start menu, choose Run, type “cmd” without the quotation marks and press Enter. This runs the Windows command-line console. Supersonic Aerospace International has designs for the Quiet Supersonic Transport (QSST), a business plane that could travel at supersonic speed with a minimal sonic boom. The Lockheed Martin "Skunk Works" design would allow planes to fly between Mach 1.6 and Mach 1.8 (almost 1,200 miles per hour) over populated land areas–twice the speed of current airlines. A flight from New York to Los Angeles could take as little as 2 hours and 15 minutes, the company says. The first test flight is expected in 2011 and the first commercial flights are slated for 2013. SAI was founded in 2000 by J. Michael Paulson, son of Gulfstream founder and former CEO Allen Paulson. The Lockheed Martin QSST design, with its aerodynamic shape and inverted V-tail, will theoretically allow it to suppress sonic booms to less than 1/100th of the level of the Concorde, according to Supersonic Aerospace International. The sonic signature is expected to be comparable to a sound level between the interior of a car at 70 miles per hour and normal talking levels. SAI is looking at a range for the plane of 4,600 miles and an engine thrust of 33,000 pounds. Plans call for the QSST to carry a maximum weight of 153,000 pounds; it will be 132.1 feet long, with a wingspan of 63 feet and an overall height of 21.3 feet.